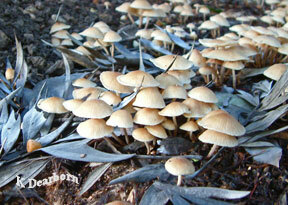 After a few days of misty drizzle there is a burst of bloom in the yard; not flowers–mushrooms. Winter (and sometimes spring) is a time for mushrooms in California and the variety is quite amazing. Mushrooms and lichen are still an area of exploration for me, but I got out my fungi book and tried to figure out what they all were. I tried to blame the compost we spread in the yard for the outbreak of these small buff-colored shrooms, but it seems they are more likely from a fungus that has been growing underground for some time. The fairy ring mushroom (Marasmius oreades) is, in fact, growing in a circle about four feet across. As the fungi grows underground it spreads out looking for nutrients. The mushrooms are a bloom, like a flower, the reproductive, spore-carrying part of the fungi. In California, this mushroom blooms year round under the right conditions and some rings have been found to be 600 years old. 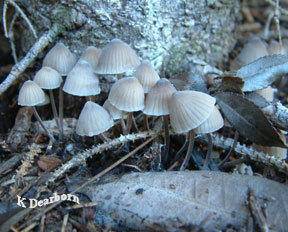 At the base of the blue spruce there was a cluster of these small mycena (Mycena arminta? 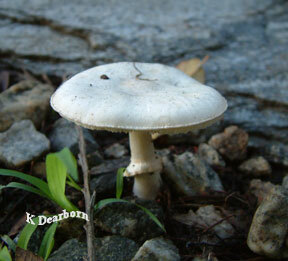 ), a fragile mushroom that is typically found in connection with decaying wood. This lovely white mushroom is probably a member of family Agaricus. It could be a pleasantly edible mushroom or a highly deadly one. This is the challenge of identifying mushrooms. You have to really know what you are doing to collect wild mushrooms for eating. 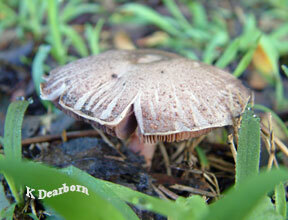 There were brown mushrooms 2-4 inches across in the areas of the yard with pine needle debris. 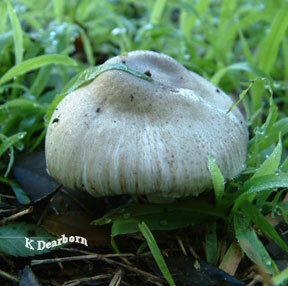 And here is another challenge of identifying mushrooms: They change in appearance as they mature. The bell shape of this species gradually becomes a flat, classic toad-stool shape. I believe these are shingled trich (Tricholoma imbricatum) but here again they are very similar to other mushrooms species, some of which are highly toxic if eaten. Go native with your yard and create habitat.